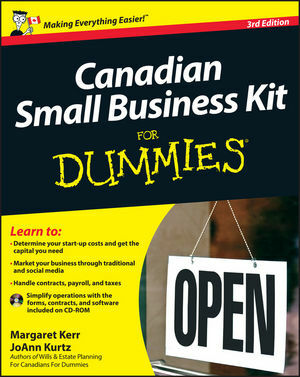 Canadian Small Business Kit For Dummies is the bestselling Canadian guide to starting and running a successful small business. This guide covers every aspect of starting, building, staffing, and running a small business, offering information for entrepreneurs starting from scratch, people buying a business, or new franchise owners. With updated information about the HST and its impact on small businesses, insight into how small business can take advantage of social media such as Facebook, LinkedIn, and Twitter, and new resources, including information about new sources of government funding for small businesses, this book is an essential guide to small business success. Margaret Kerr and JoAnn Kurtz are lawyers and entrepreneurs. They are also the authors of Wills & Estate Planning For Canadians For Dummies. Part I: Small Business Essentials. Chapter 1: Do You Have the Right Stuff? Chapter 2: Seeking Out Helpful Business Information. Chapter 3: What’s the Big Idea? Intellectual Property and You. Chapter 4: Choosing a Product. Chapter 5: Custom-made Business — Or Off-the-Shelf? Chapter 7: Getting Your Gear Together. Chapter 8: Your Business Coordinates. Chapter 9: Figuring Out Finances. Chapter 10: Writing a Business Plan that Gets You Money. Chapter 11: Making a Marketing Buzz. Part III: Operating Your Small Business. Chapter 13: Working with Customers and Clients. Chapter 14: Dealing with Suppliers and Advisors. Chapter 15: Beam Up the Crew. Chapter 16: Tax At tacks! Chapter 17: Close Encounters with Accounting. Part IV: What Does the Future Hold? Chapter 19: Get ting Bigger. Chapter 20: Closing Up Shop. Chapter 21: Ten Questions Every Prospective Small Business Owner Should Ask. Chapter 22: Ten Key Documents for a Small Business. Chapter 23: Ten Internet Resources You May Find Useful.